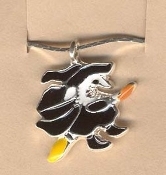 WITCH on Broomstick PENDANT NECKLACE - Halloween Enamel Charm Jewelry - Colorful, Enamelled Metal Charm. Dimensional, Detailed charm, approx. 3/4-inch Tall, on 18-inch Silver-tone Neck Chain with safety clasp.